Device for correction of human energy field by using information taken from fingers with GDV BioWell instruments. These results can help in developing a better lifestyle. 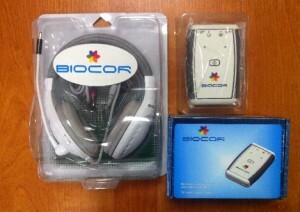 BioCor is using Extremely Hight Frequency (EHF) in the gigahertz range (4.9 mm (60.12 GHz), 5.6 mm (53.53 GHz) and 7.1 mm (42.19 GHz) of extremely low intensity (less than 10 mW/cm2). The brain produces a phenomenon resulting in low-frequency pulsations in the amplitude and sound localization of a perceived sound when two tones at slightly different frequencies are presented separately, one to each of a subject's ears, using stereo headphones. A beating tone will be perceived, as if the two tones mixed naturally, out of the brain. The frequencies of the tones must be below 1,000 hertz for the beating to be noticeable. The difference between the two frequencies must be small (less than or equal to 30 Hz) for the effect to occur; otherwise, the two tones will be heard separately, and no beat will be perceived. Binaural beats are of interest to neurophysiologists investigating the sense of hearing. Binaural beats reportedly influence the brain in more subtle ways through the entrainment of brainwaves and have been reported to reduce anxiety and to provide other health benefits such as control over pain. Lenker med mer informasjon her!